Ride-on power wheels can be a great toy for your little girl. They teach important skills such as self-confidence and cause-and-effect play. As your child grows and learns how to control their vehicle, they will understand the importance of road safety too. There is a lot of choice when it comes to ride-on vehicles, so we have reviewed some of the best available to help you make the best decision. There is a lot to think about when choosing the perfect power wheels for your daughter. You should think about her personal taste, her age and ability, her size and of course the safety features the vehicle has. 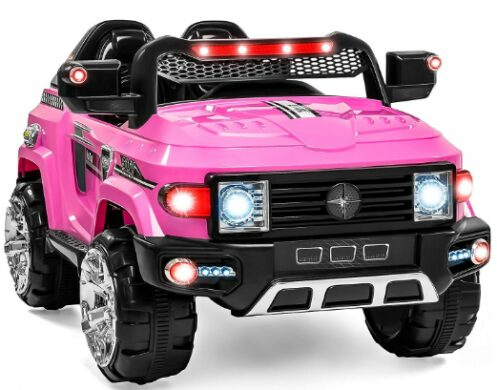 Some power wheels come with a remote for parents to take control of the vehicle. If you are buying for a young toddler, it is worth looking for a car which includes a remote, so your child can start using their new toy at a younger age. If you have more than one child who will use the car, pick one which has two seats. These are great for your daughter to go to pick up her friends, too! You might also wish to choose a vehicle with a storage compartment so your child can take their toys, snacks and drinks to the park with them. There are loads of different features on each brand of vehicle. Think about what your child will use – AUX connections, sound and light effects and anything else the vehicle may come with. You should also consider how much you want to spend – some of the larger vehicles with more features can be quite expensive. However, larger vehicles can be used by kids aged up to 7 or 8 years old so if you buy it when your child is younger, they will have years of fun with their new car. You should also think about accessories for your daughter to wear when riding in her new toy car. Whilst they are generally well-balanced and hard to tip over, you may wish to invest in a helmet and some other safety accessories. This is a really eye-catching SUV for young girls. It comes with a range of features which make it perfect for girls aged 3-8 years old. Girls younger than this can also ride in the vehicle, thanks to its parental remote. This gives parents full control of the car, meaning you can stop it quickly if necessary. It can seat one child at time and has a working seat belt for extra security. It also has a realistic appearance, with LED lights at the front and rear of the vehicle and a real horn. The suspension on this car is perfect for going off-road and it works very well on grass. Little girls will love to listen to their favorite tunes via the aux connection. It has songs built-in but you also have the option to plug in your own player and load it up with your daughter’s favorite songs. The ride-on truck has three variable speed options, so your child can go faster as they get older and become more able to control the car. The speeds can only be adjusted on the remote, so you know that your daughter won’t go too fast without you wanting them to. It comes with a charger for the truck, but you’ll need two AAA batteries for the parental controller. 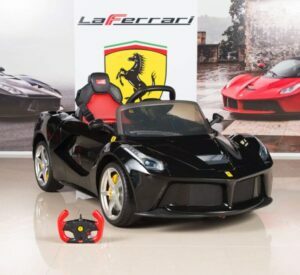 This fun, Ferrari F12 ride on is perfect for 3 year old girls. 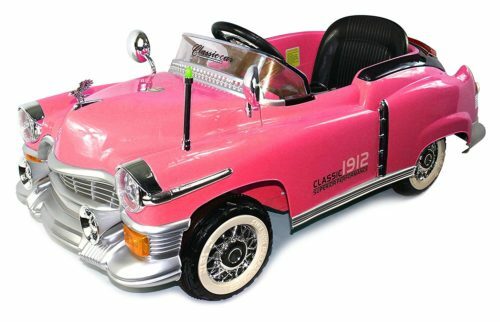 It looks and sounds just like a real car – your daughter will feel so grown-up riding in this! The car has a top speed of just under 3 mph, and can seat one child at a time. The car is powered by a 12 Volt battery, which gives 2 hours of running time on a full charge. It has realistic features such as a windscreen, horn, engine noises and even folding side mirrors! The ride-on car requires a bit of assembly but this is easy to do and won’t take long. Your little girl will be ready to start cruising around in no time! Parents will be pleased to know that the car comes with a 1-year warranty to give peace of mind. It can be used on a range of surfaces both indoor and outdoor, with rubber traction on the tires. Kids weighing up to 77 pounds can ride in this car, meaning you can guarantee your child will have years of fun. This is a great ride-on truck for young girls. It has a parental remote so you can be sure your child is safe, and it also has a seatbelt. The truck is big enough for two small children, or can seat one bigger child. 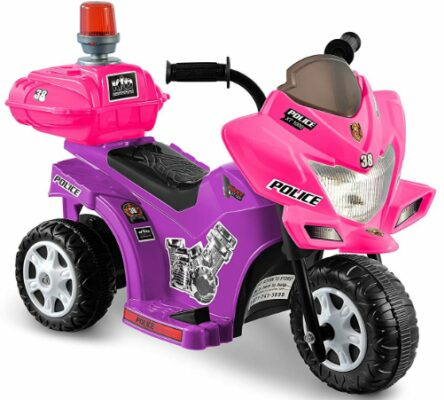 The 12-volt ride-on is really stylish, sure to delight girls of all ages. There are multi-colored LED lights across the front of the truck, making the car even more exciting. It has realistic engine noises and a horn, as well as 6 built-in songs to listen to. There is also an AUX connection so your child can attach their own device filled with their favorite songs. A remote controller is included, so parents can rest assured that their child will be safe. There is also a seat belt for extra peace of mind. The truck has a faster and slower speed, changeable by a button inside the car. This Fisher-Price car is perfect for fans of Disney’s Cars. It looks just like Lightning McQueen from the movies, and even plays realistic sounds and phrases from the movie. Girls and boys of all ages who love Cars will be delighted with this cool ride-on. The car has an impressive top speed of up to 3.5 mph, meaning it’s best for kids aged 3 or 4 and above. It works well on hard surfaces as well as grass, so your kids can go anywhere in their new car. It can even reverse, meaning it is the ideal for 6 or 7 year olds who are looking for more advanced features. 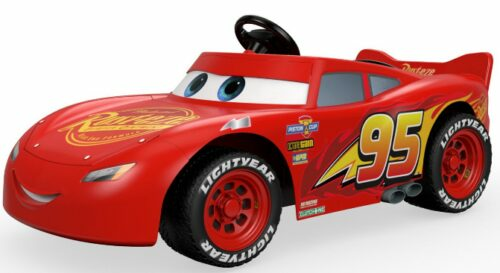 The Lightning McQueen ride-on car comes with a power lock brake system, so parents can rest assured that their child will be able to stop quickly and safely. There are buttons on the steering wheel to activate the sounds, so your child can easily operate them when they are driving. This is an ideal first electric quad for toddlers. It is the perfect size for young children to operate by themselves, and can comfortably carry two toddlers. Kids are sure to love the horn and music the quad plays. There is also a button to switch on the LED headlights for an even more realistic appearance. The ATV is suitable for indoor or outdoor use, so you can guarantee your kids can have fun on their quad no matter what the weather. It is powered by a 12 volt battery and includes a charger which is easy to use. It can run for several hours on a single charge, meaning you won’t have to worry about running out of power when you’re out and about. Even the youngest drivers will be able to figure out the simple controls on this electric ATV. There is a button to change between the higher and lower speeds, and another to change between forwards and reverse gears. The accelerator is a pedal on the footrest, so as long as your child is tall enough to reach, they will be able to operate this ride-on with no problem. 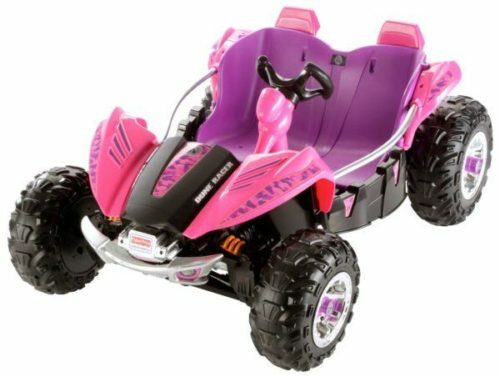 This is a perfect first power wheels for toddler girls. It’s sure to be a hit with young fans of Disney’s Moana thanks to its fun décor. 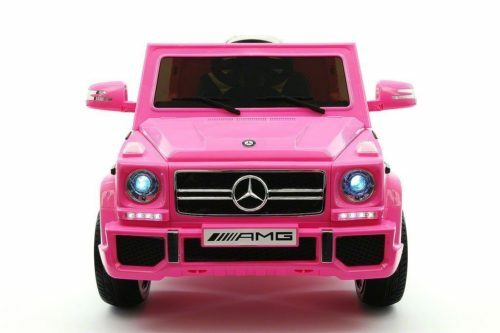 It’s perfect for girls aged 18 months and above, and is easy for younger drivers to operate. There is a button on the handlebars to go forwards, which makes it much easier to drive than with a foot pedal. The handles are easy to turn too – toddlers will find these easier to learn than a steering wheel. It travels at a top speed of 2 mph, so you can be sure your child won’t go off too fast. It can hold a maximum weight of 40 pounds, around the size of a 4 year-old. The quad is powered by a 6 volt battery, and comes with a wall charger. The toddler quad bike comes with rubber traction strips on all four tires. This gives the vehicle great grip on all surfaces, indoor and outdoor. 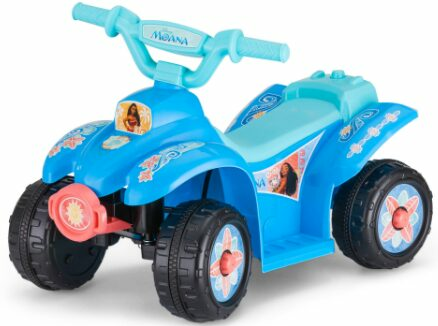 The Moana quad bike is a great introduction to power wheels for toddlers, and offers great value for money. 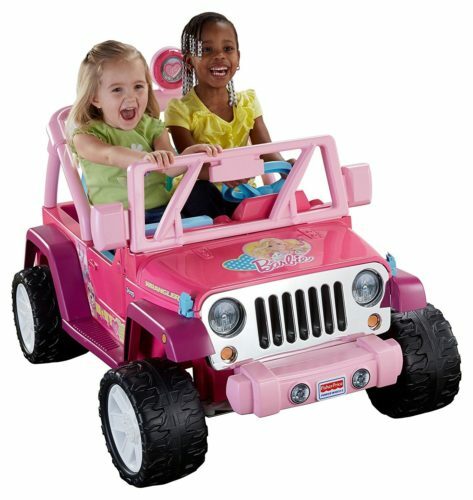 This Barbie Jeep is a great battery-powered ride-on for girls to share with their friends or siblings. It can seat two children easily – it is capable of carrying up to 130 pounds. It has loads of fun features your girl is sure to love, and she will feel so grown up picking up her friends in her new car! This Fisher-Price features a pretend radio with six tunes built-in. It also has doors which can open on both sides, making climbing in and out much easier. The Jeep has an underneath storage compartment, allowing your daughter to take her favorite toys along for a ride with her. The ride-on Jeep is perfect for 5-year-old girls, because of its large size and high maximum speed. It can be used by younger kids too, because it has a speed restrictor which limits the maximum speed to 2.5 mph. Once your child becomes better at controlling their car, the restrictor can be removed allowing the Jeep to reach speeds of up to 5 mph. The Jeep can also reverse at up to 2.5 mph, with the restrictor on or off. Parents can rest assured that their daughter will be safe in her new jeep thanks to the specially designed power-lock brake system. This means that the car will automatically stop when the child lifts their foot from the accelerator pedal. It has chunky tires which offer great grip on all surfaces. The tires also offer great stability thanks to their width, so can be sure your daughter won’t have an accident in this car. This is a great-looking electric ride-on car for young kids. It can comfortably seat one child weighing up to 55 pounds, making it perfect for children aged up to 7 years old. 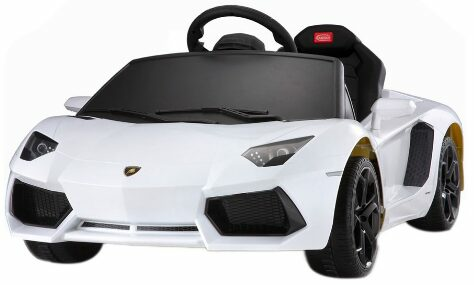 The Lamborghini also comes with a remote control meaning toddlers can enjoy a ride in this stylish car, too. It drives just like a real car – use the key to start it before playing around with forwards, reverse and stop gears. The 6-volt battery-powered car also comes with an adjustable seatbelt for added safety. There is the option to connect an MP3 device to the car so your child can rock out when they’re on an adventure! The car features realistic lights and sounds, including a horn – sure to delight children of all ages. It can reach speeds of nearly 2 mph, so you can be sure that your child will be safe when driving their new car. The car takes up to 8 hours to fully charge, and the remote requires a 9-volt battery, so be sure to stock up on these when buying this car. This is a really attractive electric ride-on sports car sure to delight any little girl. It can be controlled by parents via the included remote, making it perfect for even the youngest drivers. It has room inside for one child up to 7 years old. There is a low speed suitable for younger children who are just learning how to drive their new car, and a higher speed for expert drivers! It has a built-in radio and there is also MP3 connectivity, so your daughter is sure to find her favorite songs to drive to. This girls’ pink car comes with working headlights and a horn to give it an even more realistic appearance. The powerful battery allows for up to two hours driving time on a single charge, more than enough for a drive around the town. It does take up to 10 hours to fully charge, so it’s best to leave it charging overnight before using it. This is a really attractive electric ride-on sports car sure to delight any little girl. It can be controlled by parents via the included remote, making it perfect for even the youngest drivers. It has room inside for two children up to 7 years old. There is a low speed suitable for younger children who are just learning how to drive their new car, and a higher speed for expertdrivers! It has a built-in radio and there is also MP3 connectivity, so your daughter is sure to find her favorite songs to drive to. This girls’ RZR 900 comes with working headlights and a horn to give it an even more realistic appearance. The powerful battery allows for up to two hours driving time on a single charge, more than enough for a drive around the town. It does take up to 10 hours to fully charge, so it’s best to leave it charging overnight before using it. This stylish electric toy car is sure to delight girls of all ages, and even parents will love the attractive design. It is spacious inside, comfortably seating one child aged up to 7 years old. There is also the option to control the car via a remote, so parents can have complete peace of mind when younger children are driving the car. The remote-controlled ride-on car includes a built-in MP3 player and even comes with an AUX cable so your daughter will be ready to listen to her favorite songs. It also comes with pre-programmed sounds and has flashing lights. The car drives well on all surfaces, including grass, so your daughter can take her new car anywhere. It can travel at a top speed of around 2.5 mph, and has a battery life of up to 2 hours on a full charge. The battery takes up to 12 hours to charge fully, so it’s best to leave it overnight so it’s ready to go by morning. This is a beautiful quad bike for girls who want something a bit more advanced. 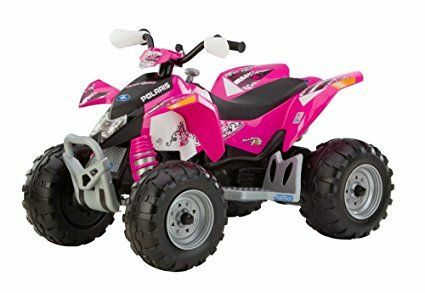 Boasting an impressive top speed of up to 5 mph on the high setting, this is the perfect vehicle for 5-year-old girls and older. Younger kids can ride this quad bike too, but the size and speed make it more suited to slightly older children rather than toddlers. It has two forwards gear speeds and one for reverse. It has a lock on the higher speed, meaning you can limit how fast your child can drive until they are able to properly control the quad. As you would expect from a vehicle of this type, it handles well on all types or terrain from dirt to pavement. Therefore, it is ideal for those who have access to land, or for taking on trips round the park. It can carry up to 85 pounds well, but it can also cope with two kids riding together, but the battery may not last as long. This is a great 6-volt battery car for older girls. It looks just like a Corvette C7, in a smart pink and white color scheme. It is ideal for one child, up to 65 pounds in weight, meaning your little girl can ride in this car until she is 8 or 9 years old. The Fisher-Price ride-on car can travel at up to 3.5 mph on either hard surfaces or grass, and has both forwards and reverse gears. It has a Power-Lock brake system, meaning the car will come to a stop when the foot is removed from the accelerator pedal. The Corvette ride-on doesn’t come with a parental remote, so it’s ideal for slightly older girls who will be able to drive it by themselves. It includes a charger for the car’s battery, and is really easy to assemble. Your girl will be ready to hit the road in her new car in no time at all! This stylish single-seater Mercedes ride-on is perfect for 2-year-old girls. It has impressive safety features to keep parents at ease, including a remote. The remote has an important emergency stop button, so you can quickly stop the car if your child gets into trouble. It has two speeds, up to 2 mph on the slower and up to 4 mph on the higher setting, and can also reverse. It can carry a child weighing up to 66 pounds, so you can be sure your child will get years of enjoyment from this vehicle. The ride-on car has comfortable leather seat, fitted with a 5-point safety harness. It offers a comfortable ride, with gradual acceleration and full shock absorbers. The truck also has LED headlights and tail lights, and realistic sound effects. It can play music from an MP3 device or USB drive, so your little girl will always have access to her favorite songs. This cute electric ride-on motorcycle is the ideal first power wheels for young toddlers. The maximum speed is a little over 1 mph, making it great for young drivers! The maximum capacity of the bike is 33 pounds – perfect for kids up to 3 or 4 years old. The electric bike has a handy storage box on the back perfect for your daughter to take her favorite toys for a ride. It also features working lights and siren noises, sure to delight youngsters. The motorcycle is operated by a foot pedal with no complicated controls, making it easy to learn. The 6-volt battery-powered bike is easy to assemble. It comes with the required charger, easily connected under the seat. The battery lasts well after a full charge, giving hours of fun driving around! It works best on hard surfaces and can be used indoors as well as outdoors. 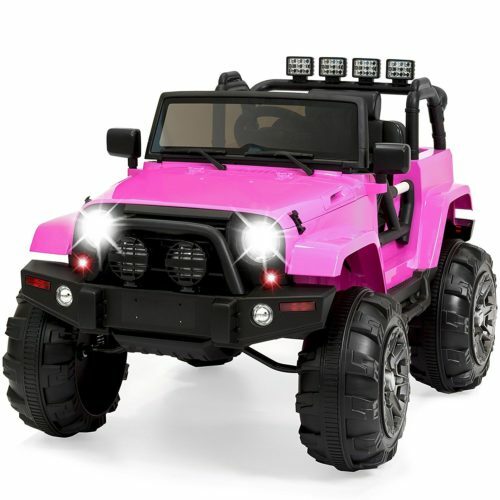 This is a great electric car for girls who want an off-road vehicle for the ultimate driving experience! It can reach speeds of up to 2.5 mph, in both forwards and reverse, perfect for amateur drivers. The vehicle can run for about an hour after a full charge, so you can be sure to have plenty of adventures. The electric SUV ride-on can seat one child up to 6 years old. There is a real horn to add to the fun! The car is perfect for older drivers due to its size, and it doesn’t come with a parent remote. There isn’t a seatbelt either, so it’s definitely not the right car to buy for a young toddler. 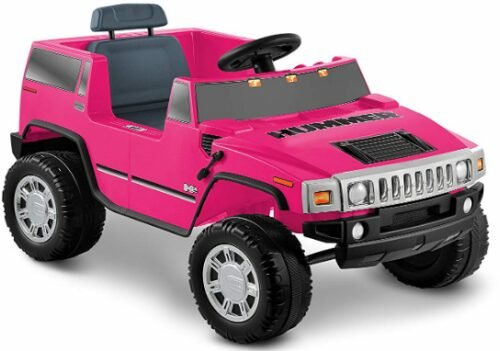 The Hummer ride-on is easy to assemble, so your princess will be ready to go for a ride in no time. The car is easy to operate – there is a foot pedal on the floor to accelerate, and the horn is operated via a button on the steering wheel. There is a switch to change between forwards and reverse on the dash. 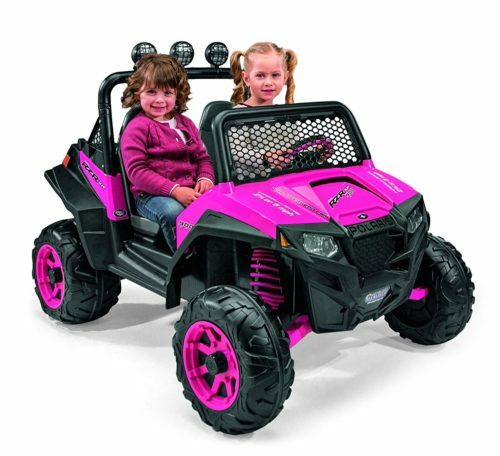 This eye-catching 2-seater power wheels is great for girls who love to go off-road. It looks great – just like a real Ford truck. Mom and dad are sure to love this fun truck too! It has two forwards speeds, offering a maximum speed of up to 5 mph on the higher setting. This Power Wheels has a great storage space to the rear, with a working door to access it. The car can hold a total maximum weight of 130 pounds, perfect for two bigger girls and all their belongings! It has a working FM radio for your child to find her favorite songs to drive to. The Ford ride-on is great for older kids due to its large size and higher maximum speed. It has knobbly tires perfect for all terrains, even rougher ground. Parents will love the included 1-year warranty, and if anything does go wrong there are hundreds of service centers across the country. Our favorite power wheels for a young girl is the Peg Perego Polaris. It is perfect for siblings, or girls who plan to take friends along for a ride, as it can seat two children aged up to 7. The SUV offers two speed settings and a parental remote, so it’s perfect for younger drivers. It runs well on all surfaces and has a powerful battery which gives up to two hours of use on a single charge. The seats are adjustable to fit growing children, and there is a storage compartment behind the seats. Your daughter will have so much fun with this ride-on truck and it will last for years, making it well worth the money. 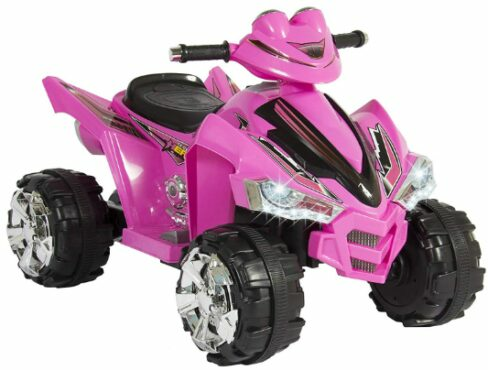 If you are looking for the best value ride-on vehicle for your daughter, the Electric Pink RC Car is perfect. It can be used by children of all ages, from toddlers right up to 7 year olds. The remote makes it perfect for younger drivers who haven’t yet mastered the controls. It comes with two speed options, so it’s also ideal for more experienced drivers who want to go faster! There is a range of great features on this car, such as MP3 connectivity, headlights, and a working horn. This car is sure to be a hit with girls of all ages and comes at a great price. There are many different types and we have chosen a selection of these to review here. There are 4×4-type vehicles, sporty cars, tractors, trucks, motorbikes and quad bikes to name just a few. Many power wheels are based on real cars, with brands such as Ford, Jeep and even Porsche being scaled-down and made into a toy for kids. There are even ride-on toys based on characters from your kids’ favorite movies – we’ve included a Cars and Moana option here. There are some ride-on cars which use a 6-volt battery, whilst others are powered by 12-volts. Some are suitable for kids aged from 1 to 7 years old, depending on the style. Vehicles with handles rather than a steering wheel tend to be easier for younger kids to operate, so make the ideal choice for toddlers. Some electric ride-on cars can also be controlled by an included remote, making them perfect for younger children. The cars can then be controlled by the child independently as they grow more confident in their driving abilities. These little cars for kids offer some of the same features as a real car, and many of them have a very realistic appearance. Some have storage compartments, opening doors and different gears. When choosing a car for your daughter, you want to make sure you are getting a high-quality product. Safety is very important with a toy like this so you’ll want to choose a brand which is well-known for producing high-quality goods. The original brand is by Fisher-Price, which is an excellent choice. They offer a wide range of styles, suitable for different age ranges. They come at a reasonable price and look great. Fisher-Price Power Wheels are made of strong, durable materials sure to last your child years. Another quality brand of vehicle which is great for quad-style vehicles is Peg Perego. We have reviewed a few of their products below – they offer great features for young drivers of all ages! The vehicles can handle all terrains well and are easy to operate. Peg Perego quads are really eye-catching and are sure to make your little girl stand out. Best Choice Products also offer a great range of stylish wheels for girls, a few of which we have listed here. They are very parent-friendly, with many of the products coming with a parental remote controller to offer peace of mind. Best Choice Products battery-powered cars come with fun extras such as AUX connectivity and working headlights and sound effects.